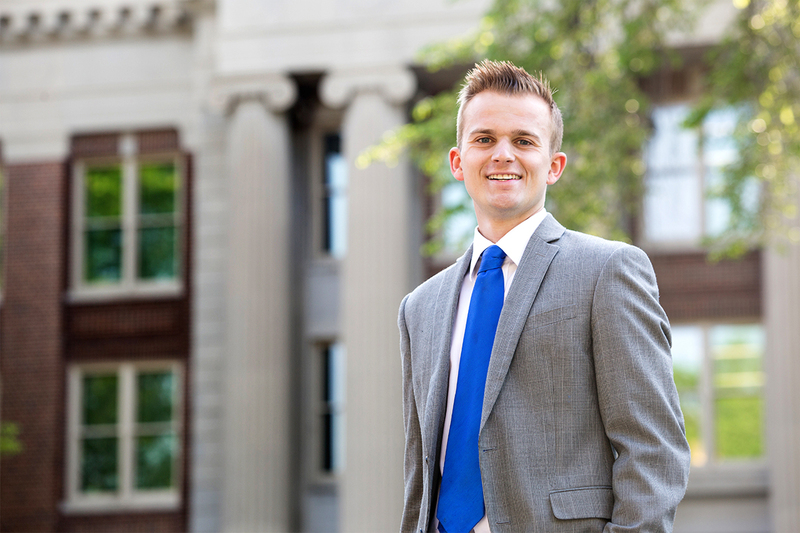 Jack Zabel, BME ’18, remembers his first collegiate sales competition was nerve wracking. But he made it through the roleplay-style contest and earned second place. A year and many competitions later, Zabel became student council president of the Center for Sales Leadership and Education. The center in CEHD is directed by founder Roy Gaddey Jr., former vice president of business development for a Fortune 500 company, to create opportunities for students in any major at the U to develop practical sales skills and real-world connections with local business leaders. Competitions, career fairs, and networking events prepare them for success after graduation and help local corporations recruit talented young graduates. a suit, Zabel says, even for those who don’t struggle financially. Having the right kind of clothes gives students confidence as they attend networking events and job interviews. Nearly 200 men’s and women’s suits, ties, shirts, and accessories were given away that day. This spring, every senior member of the center had a job offer before graduation. Zabel accepted a position with a law group in San Diego. From building his skills and confidence to connecting him with college internships, the center made the difference for him. A new gift from alumnus Patrick Campbell and his wife, Shirley, will make it possible for the Center for Sales Leadership and Education to expand its programs and serve more aspiring business leaders. With support from the Campbells, the center is able to create life-changing experiences for young people like Jack Zabel, building a bright future for students pursuing business endeavors. Support student scholarships at cehd.umn.edu/giving. Contact us at 612-625-1310.